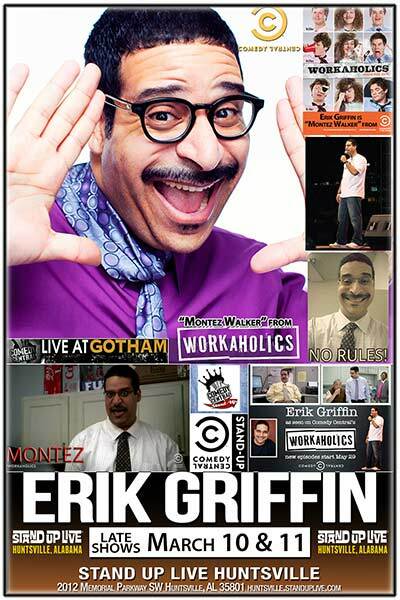 Erik Griffin: A towering force of comedy, Erik Griffin is most recognizable as the mustachioed Montez Walker on the hit Comedy Central series WORKAHOLICS, which recently wrapped its seventh and final season. Griffin is currently a series regular in Showtime’s dark-comedy series I’M DYING UP HERE that is in production on season 2. Based on the book by former L.A. Times writer William Knoedelseder, the fictionalized series is set in the celebrated yet infamous L.A. stand-up comedy scene of the '70s, and co-stars Melissa Leo, Al Madrigal and Ari Graynor, under executive producer Jim Carrey. Griffin also has an hour-long comedy special, THE UGLY TRUTH, on Showtime. On the big screen, Griffin can be seen in Jake Szymanski’s MIKE & DAVE NEED WEDDING DATES and Kerem Sanga’s FIRST GIRL I LOVED. He recently starred in Laurie Collyer’s feature FURLOUGH.